Here is a unique way to wrap a gift. 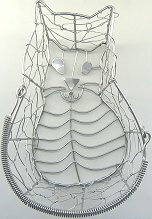 This chrome wire cat basket is 7" long x 4 1/2" wide at the widest point x 3 1/2" deep. Attached handle. Line the basket with tissue and add a gift.